If you share my passion for history, you will remember this sentence: “peace is the right time to prepare for war”. I agree fully with this old saying even though it reminds me of humankind’s darkest periods, when racism or the arms race cast their shadows over civilization. Aren’t we all in a state of war between what we want and what we are? Aren’t we always in a hurry to finalize what we have in our hands to free them in order to receive the next task in the queue? Aren’t we always using, one way or the other, the “we do not have time” pretext? We complain about the lack of time; we blame it when we are behind schedule and below target. But, we never ask ourselves if we are using time wisely. You have to acknowledge the truth. Time is not the real problem and the solution lies within your first and biggest enemy: “you”. It is only after conquering and taming your chaotic nature that you will be able to start the long journey towards a better “you”. Time management goes beyond managing time; it is about managing ourselves. It is about taking charge, changing our habits and the activities that waste our time. It is choosing willingly different methods and implementing ideas that can assist us in finding the best way to make the best use of our time. 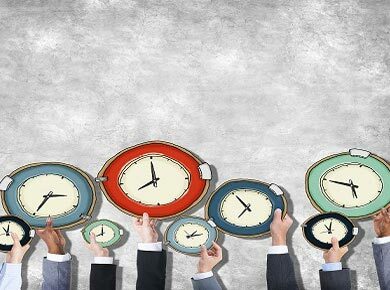 Managing time means being efficient and effective in achieving what we want. It also means spending our time on what is important, not just urgent. However, we are often sidetracked by less important things and fail to attain our goals and achieve the many other things we would love to do but simply do not have time for. In brief, managing time, being assertive and reducing time wasters are decisions that only you can take, implement and repeat. If you don’t, you are sure to lose the war. After reaching step 6 repeat step 3, but this time with more confidence and accuracy. With time you will no longer walk, you will run and race. Mastering this cycle will win you battles and eventually the war. By repeating this routine day in and day out you will acquire a new behavior. With commitment and perseverance this new behavior will become a habit, and all the things you though were impossible will become a reality that can then be performed at a fraction of the effort and time they used to take. This is a never ending path and it needs perpetual effort. However, once you win the first habit, you will be eager to conquer more. Use your newly found stock of time for personal development, strategic planning or for spending it with your loved ones. Life is a cycle, once we know its pattern and pace we will find peace.